After a three-year investigation, the European Commission has concluded that the US firm's Irish tax benefits are illegal. The Commission said Ireland enabled the company to pay substantially less than other businesses, in effect paying a corporate tax rate of no more than 1%. Ireland and Apple both said they disagreed with the record penalty and would appeal against it. The standard rate of Irish corporate tax is 12.5%. The Commissions's investigation concluded that Apple had effectively paid 1% tax on its European profits in 2003 and about 0.005% in 2014. The company said: "Apple follows the law and pays all of the taxes we owe wherever we operate. We will appeal and we are confident the decision will be overturned." The record tax bill should not be a problem for Apple, which made a net profit of $53bn in the 2015 financial year. The US Treasury, which said last week that the European Commission was in danger of becoming a "supranational tax authority", said the latest ruling could "undermine foreign investment, the business climate in Europe, and the important spirit of economic partnership between the US and the EU". 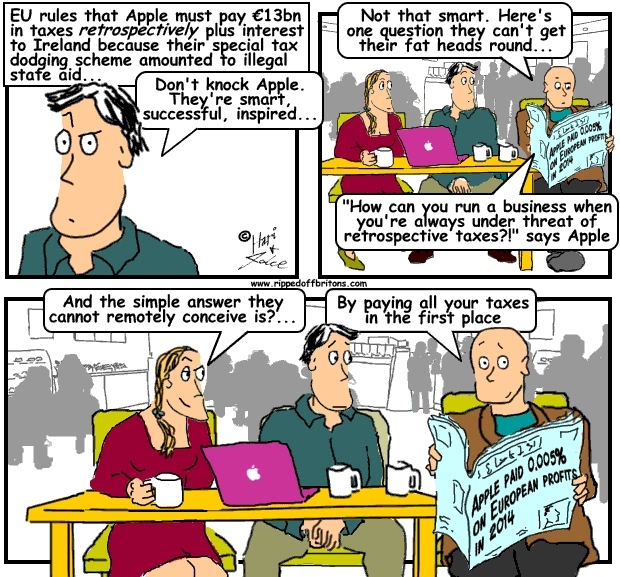 In Apple's case, 90% of its foreign profits are legally channelled to Ireland, and then to subsidiaries which have no tax residence. At the same time, countries can scarcely afford not to co-operate when Apple comes calling; it has a stock market value of $600bn, and the attraction of the jobs it can create and the extra inward investment its favours can bring are too much for most politicians to resist.